This prompt, Old, abandoned buildings: cool or creepy?, is provided by Plinky. 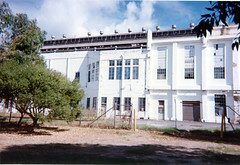 On of my favourite old abandoned buildings around Perth is the old East Perth Power Station. Located on the river, just north of the Graham Farmer Freeway, for a while it has sat there abandoned, not doing anything. There was a plan to redevelop the area, and create an arts precinct of sorts there. However, that plan has been dropped as the government (who is in the middle of a resources boom) tries to save money (but is willing to spend $700 million plus transport infrastructure upgrades on a new football stadium just the other side of the river). It’s a real shame, as if done correctly, the power station could become a really unique performance venue, and with quality development around the building, such as coffee shops, art galleries, boutique shops and more, it could be a great place to be. But instead, the power station just sits there, having had some restorative work done to it, and then nothing more. I hope that one day something gets done to make use of this fantastic place, but I’m not holding my breath.